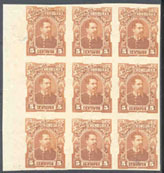 5755 EP HONDURAS (1891) Luis Bogr�n*. 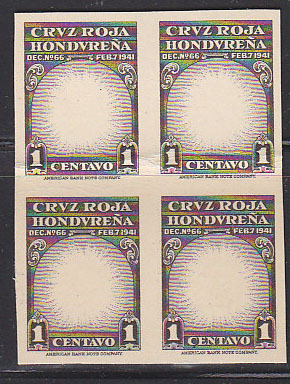 Trial color proof of regular issue (5 centavos, President of Honduras) in block of 9, ungummed as printed, color different from regular issue (pale brown). Scott No 53, Yvert No 34. Rare and unusual! 5076 EP HONDURAS (1945) Mother & child*. Proof bl/4 missing impression of vignette on card. Scott No RA3, Yvert No TB2. 612 EP HONDURAS (2001) Yellow-naped amazons (Amazona auropalliata caribea)*. Imperforate margin pair. Scott No 1090. Only 2 sheets exist! 646 EP HONDURAS (2001) Common ground doves (Columbina passerina)*. Imperforate margin pair. Scott No 1091. Only 2 sheets exist! 11170 EP HONDURAS (2004) Seashells*. Set of 5 imperforate pairs. Scott Nos C1169-73.